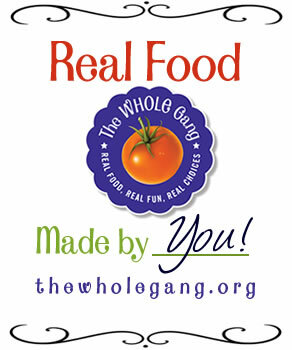 This is the first week of our Real Food Weekly blog carnival. It will be a weekly event where you can share your recipes and meals that you created using real food. First let’s define what Real Food is so you will know what to expect. Let’s start with what each word means on it’s own. Real Food is food that is not processed. You didn’t open a box that has cooking directions and added something to it. Real Food can also include what is referred to as “green”, “fair”, “local”, “sustainable”, “whole” and “slow”. For this blog carnival I’m most concerned with the “whole” foods. Those that are not processed. It’s really very easy to participate so let’s get to the guidelines. Now look for the words, Click Here To Enter so you can link up your recipe! Thank you. Thanks for hosting this Diane – this is great! Can't wait to come back and read all the rest that are posted! AndreAnna thank you for sharing. I linked up the pina greena smoothie that I'm challenging those who are phobic about green smoothie to try. 🙂 Love your new weekly roundup, Diane! Shirley thank you for sharing! Thank you for hosting! I love making new Real Food friends! Lisa, thank you for sharing. It's so nice to meet you! Here is my Tomato Bean Soup (GF, CF) for this great idea you've begun. I can use the impetus to cook something particularly "REAL" every week! Pat thank you for sharing! Diane, you always have such great ideas. Where do they come from? Your brain is always going. No wonder you started yoga this year. 😉 Can I link up old posts? Trying to catch up on all my reviews and giveaways on the blog right now, but I have a few older posts that have real food recipes. Would love to link those up because I want that badge. Some nice bling for my blog. Tia you can absolutely link up old recipes, just as long as you have the link back to this post on your recipe post. Did that make sense? Yes my brain never stops except when I'm in yoga. No wonder I'm loving it so much. Oh and yes feel free to add some real food bling. I like that so much I'm going to add that into the page with the bling. Hi Diane- thanks for hosting! I am sharing my recipe for Pork And Pumpkin Soup this week. Thank you Andrea for sharing. OK. I am linking up my Christmas Lasagna in honor of my husband. He asked for it for his birthday dinner this week. It's really just a healthier lasagna. All real. (It's no where near dairy-free, though. Sorry.) But there are no noodles. It's chard instead. Tia, thank you for sharing! Love this new idea, Diane!! Linking up my Kid-Friendly green smoothie post! And the new badge and look are AWESOME! You and Lex came up with a great look!! Thank you Kim for sharing your smoothie and yes I love what Lexie did for my new logo at the top of the blog. Mary made the badge for me for Real Food Weekly. Such talent out there. Is a picture required to enter? I'm so far from a food photographer its ridiculous, but I would love to enter some recipes! Freedom- Nice to meet you. It would be great to have you participate. Use the linky and follow the directions. At one point it will ask if you want a picture from your computer or web. If you pick web it will pull photos from your blog. It will probably pull the photo at the top too and you could use that one. Give it a try as you can stop it at any point. You can also delete when you're done if you don't like what came out. Hope to see you there! Okay, hopefully mine counts! All real food, but I do use organic powdered sugar. Sugar's okay right? OMG Diane, your blog seems to be constantly evolving! It looks great and I love the picture of you, so perfect! Alisa, thank you for sharing!